As a Native American: Okay, so I’m mostly white. But the fact is I have a grandfather who grew up on a reservation, and half-uncles who still live there. Any exposure to sunlight turns me from dark-haired white girl to “are you Hispanic?” And I was raised with a healthy respect for nature, an awareness that alcoholism and gambling can get out of control, and the notion that the Solstices and Equinoxes were the “real” holidays, even though we celebrated Christmas and Easter. I’m not sure white(r) kids were taught those things to the degree I was. 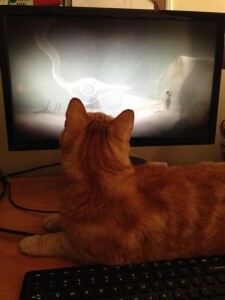 Never Alone was AWESOME. Nuna, the protagonist of the game, looked like me. Seriously, I could relate to her in a way I’m not sure I ever have with a video game character before. I mean, I kinda look like Lara Croft, but I feel like I could relate to Nuna more. Plus she had a sidekick fox, and pretty much the whole time I was playing the game I had a sidekick cat with me (pictured). The game also took the mythology very seriously. Sometimes, in fantasy games/movies/books or in reenactments of mythologies, you get the sense that it’s “just a story.” This wasn’t “just a story.” It was, for all intents and purposes, real. Kind of like how the Harry Potter stories just feel real. As a linguist: The narration was done in Iñupiat! Uh, how cool is that? As a linguist, hearing another language you don’t get to hear very often is very exciting. Also, they were very big on accessibility. The subtitles were translated into nine different languages!! For such a small indie game, that’s a LOT of localization development to do! And from the credits, it looks like they employed many community members as well as anthropologists and ethnomusicologists. The game also includes cultural insights, which are videos of the Iñupiat people discussing their culture that you unlock as you play. Unfortunately, trying to access these cultural insights crashed my entire computer. This is probably not the Never Alone dev team’s fault, as I was playing on Linux (which isn’t technically a supported platform). Hopefully I can get those working and watch them soon! As a gamer: According to Steam, I logged 3.4 hours and got 67% of the achievements. I also beat the game (I got to the end credits and I stopped the blizzard) in this time. There were a few owls I saw but didn’t get, so I’m assuming that’s where the other 33% of achievements are. I honestly didn’t mind paying $13.49 (it was 10% off when I bought it), because I wanted to support the developers and the tribe. But I do know a lot of gamers who would complain about paying that much for a game that takes less than 10 hours to complete. Also, while it was fun and I might play it again, I’m certain most of the appeal to me is as a linguist and a Native American, and not as a gamer. The initial release of the game was a little buggy, and I honestly think I was only able to get past this one certain part because, after I got stuck on it and quit for a while, the version 1.2 patch was released so when I went back to play, the bola controls and the fox’s AI were fixed. The game play is very reminiscent of Donkey Kong Country Returns on Wii. There are a lot of carefully timed (and sometimes difficult) jumps to make in a primarily 2D landscape with beautiful 3D backgrounds and characters, and very nice music. There are, to a degree, some of the puzzle aspects you’d find in a Zelda game as well, like pushing and pulling blocks. In terms of difficulty, I would say it’s about as difficult as Donkey Kong. There are two areas which, in a traditional game, you might consider to be “boss fights,” but I’m hesitant to term them that because this game is just so unique in its story telling. These “boss fights” were escaping a polar bear’s den and escaping a giant ice-man after you stole his adze. These were both extremely difficult for me, partially because I knew I had to jump to a certain spot, but for a long time I couldn’t figure out how. They involved very difficult, precisely timed jumps. While I have the spoiler tag on, I’d like to say that the very, very end of the game was reminiscent of the very, very end of Ocarina of Time. As in, your spiritual companion says “what a great journey, it’s time to go, see you later!” And it’s very sad. So, overall, the average of my three ratings is a 9.16/10. I really liked the game and it’s story, and I’m really glad I was able to learn about and support this culture. But it’s honestly maybe not the best in terms of a game. The mechanics are fairly simple (akin to Mario or Donkey Kong), and I was left feeling disappointed it was over and wanting more because it was so short. I’d love to see several myths told in succession (or “levels” or “chapters” or however you want to divvy it up). It was a great start for these indie developers and for this tribe to share their culture, but there is still room to grow! !